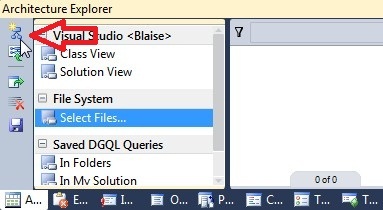 We need to refactor a solution with 200+ projects in Visual Studio 2010. The solution must be split into a runtime and a design solution. As we have the Ultimate edition, the Architecture features will be used. With the Dependency Graphy we planned to view which projects could be simply moved and which projects needed some refactoring. But we came across some gotchas. 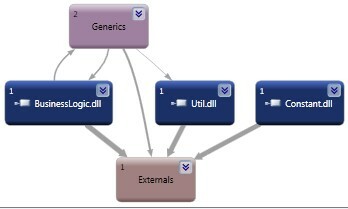 When Visual Studio generates the dependency graph by assembly (picture below) the references between the assemblies are not shown. Externals and Generics are added automatically. So the link is there but you have to search for it. As you could see in the Dependency Graphs above we use a Constant assembly to store those hardcoded strings and provide some sharing. The compiler actually replaces the constant in the code with the value of that constant (MSDN) as you can check with reflector. The Dependency Graph uses the IL code and therefore cannot know the constant is defined in another assembly. Static (printouts) graphs will never contain all the information and be readable at the same time. The dependency graph is a great tool to interact with your codebase. I think that is the only way to document your solution. Figured out a workaround for the crash from the General hickup. 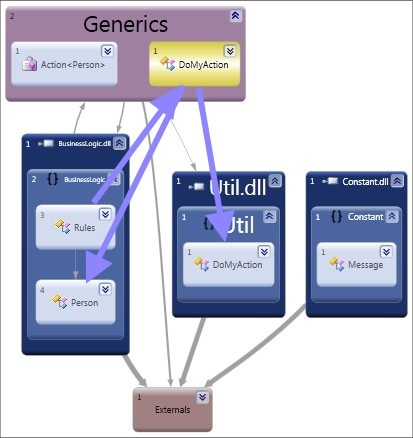 This entry was posted in Development and tagged .NET, architecture, const, dependency graph, Design, generics, Visual Studio 2010. Bookmark the permalink.